Groups provide a space in Populi for different segments of your school's community—clubs, teams, committees, you name it—to communicate, share files, and create events with other members of that group. All you need to join and participate in a group is an active Populi user account. You can let anyone join a group or you can restrict the group to particular user roles. There are three levels at which a person may participate in a group. Group administrators are in charge of the group's settings, and can otherwise oversee all aspects of a group. The person who creates the group is the administrator, but this can be changed after others join the group. Moderators, depending on the settings, can invite members and oversee group activities. Moderators are appointed by the group's administrator. Members can participate in the shared activities of the group, and may have other abilities depending on the group's settings. Groups include a bulletin board, discussions, chat, files, and calendar. Here's how to create a new group. Go to Home > Groups. Give the group a name (required) and a description (optional). Open to select roles: Any user with the role(s) you select can go to the group dashboard and click Join. Anyone without the role can join with an invitation. Invitation only: Users can join only if invited. Choose which people in the group can invite new members: Any member, Admins and moderators, or Admins only. Select whether to make the group Public. Public groups and their membership are visible to any user at your school; private groups are hidden from everyone except members and invitees. After creating the group, you'll see it in both All Groups and My Groups. 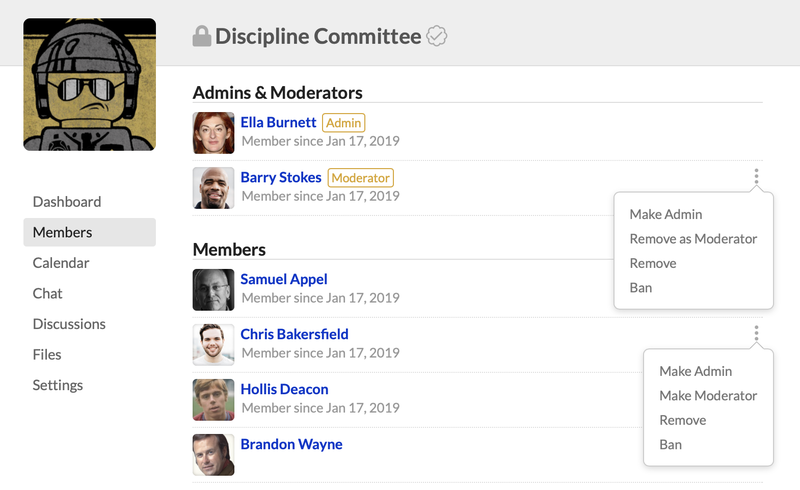 As the group's administrator, you can now start inviting members (see below), posting bulletins and discussions, uploading files, and adding calendar events (covered in this article. You can only invite active Populi users to the group. Group administrators can always invite new members. Depending on the group's settings, moderators and members may also be able to invite members. The invitation process works the same for each kind of person. If someone has a user role specified in the group's settings, she won't need an invitation: she can just go to the group dashboard and join there. Go to the group's Members view. Repeat the above step until your invitee list is complete. Check to email invitations to each invitee. When setting up the group, set Membership to Invitation only. When people go to the group dasboard, they can click Request Invitation. 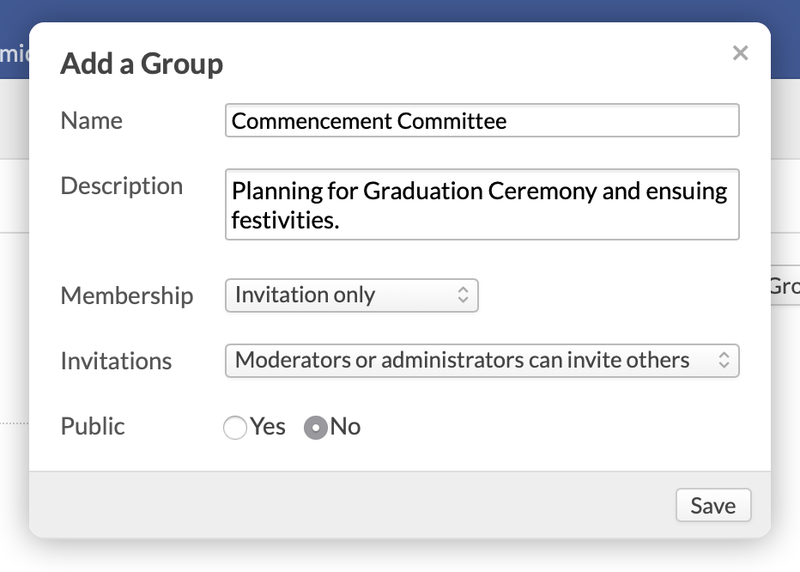 Depending on the group's Invitations setting, the group administrator, moderator, or member can go to the Group's members view and see the list of requests. Click and select Send invitation. If you emailed invitations, they'll receive an invitation with a link to the group Dashboard view. When an invitee logs in to Populi, he'll see an Alert on his Home > Dashboard view about the invitation. He can also navigate to the group's Dashboard and join there (or ignore the invitation). Make/Remove Admin: Any admin can give any other member administrator privileges; likewise, any admin can remove that privilege from any other admin. Make/Remove Moderator: Any admin can give any other member moderator privileges; likewise, any admin can remove that privilege from a moderator. Remove: After removing a person, he can re-join the group according to the membership settings. Ban: After banning a person, he cannot re-join the group until you lift the ban. Any group member can leave the group by clicking in the upper right corner of the screen. In the group Settings view, administrators can control how different aspects of the group will work. Mark official: Staff members at your school can mark a group official . Delete group: Any account admin, Academic Admin, or the group's administrator can delete the group altogether. To change a particular setting, click its name, make your changes, and click Save. The Change Log shows changes to membership and the group's settings. Have a look at this article to learn how to use and moderate a group. Go to Home > Groups > All Groups. Next to Show, select Pending from the drop-down. Choose the group you'd like to review for approval from the list. On the group's dashboard, click Pending Approval and choose whether to Approve or Deny the group.